Nifty closed the week on positive note gaining around 1.40%. As we have mentioned last week, that resistance for the index lies in the zone of 10450 to 10550 where short & medium term moving averages and highs for the month of March-2018 are lying. 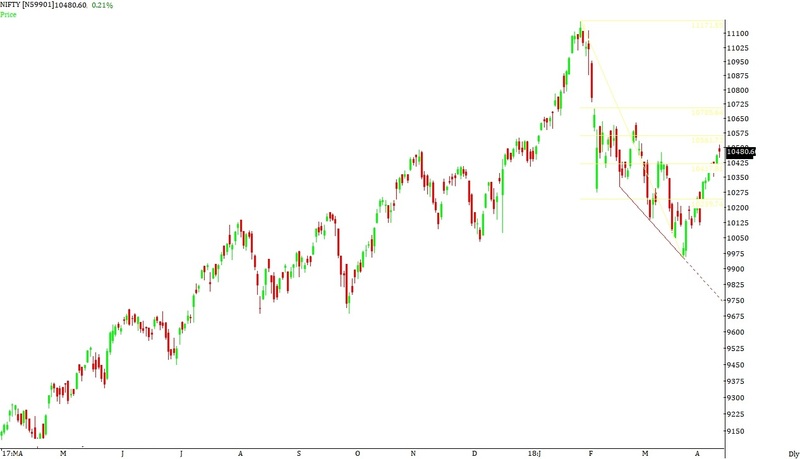 If the index manages to close above these levels then the index can move to the levels of 10700 to 10800 where Fibonacci levels and gap is lying. During the week the index manages to hit a high of 10520 and close the week around the levels of 10481. Minor support for the index lies in the zone of 10350 to 10400. Support for the index lies in the zone of 10200 to 10250 where long term moving averages and Fibonacci levels are lying. If the index manages to close below these levels then the index can drift to the levels of 9980 to 10030 where the index has taken multiple supports in the month of November-2017 & December-2017. Resistance for the index lies in the zone of 10500 to 10600 where high for the month of March-2018 and Fibonacci levels are lying. If the index manages to close above these levels then the index can move to the levels of 10700 to 10800 where Fibonacci levels and gap is lying. Broad range for the week is seen from 10200 on downside & 10800 on upside.